Douglas Fir is an American native evergreen tree from the north-west, that makes a beautiful specimen tree or windbreak. 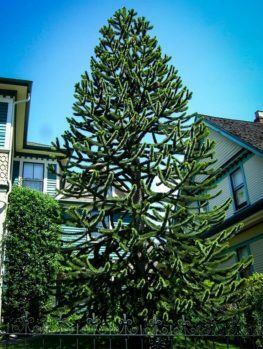 It has an attractive conical shape with a symmetrical form, with the branches growing right down to the ground for many years. It prefers areas with cooler summers and a good water-supply, so it is a good choice for gardeners in the north-east and north-west, or with gardens in hilly or mountainous areas. It will grow best in deep soil that does not become too dry in summer. This tree has no significant pests and diseases and grows best in zones 4 to 6. If you are looking for an outdoor Christmas tree to decorate, a Douglas Fir is perhaps the best possible choice you can make. 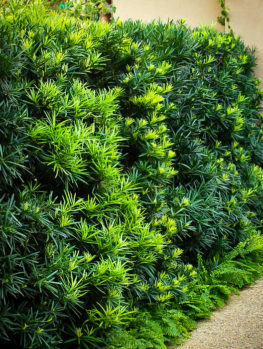 Evergreens are an important part of the garden landscape. 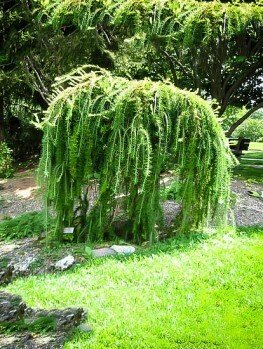 They give height and all-year structure and make great accents and lawn specimens. 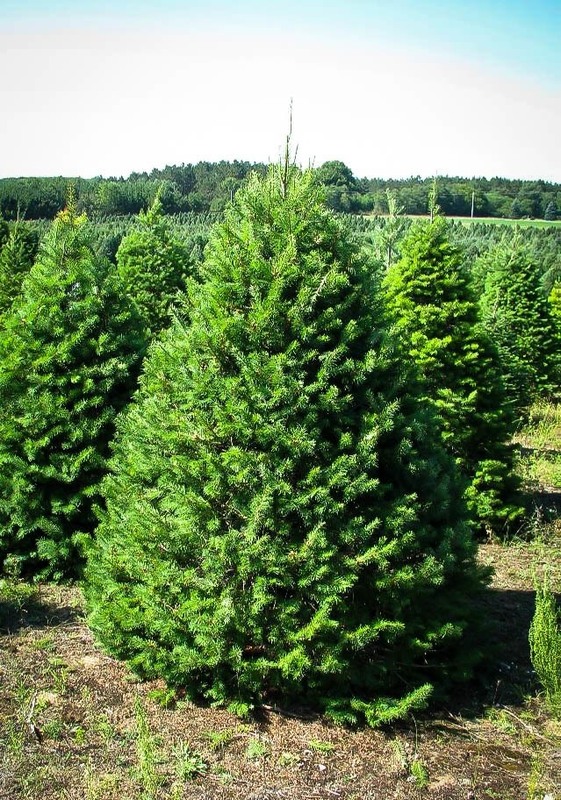 The classical conical shape of a needle-leaf evergreen gives dignity and character to your house and the Douglas Fir is a wonderful choice for gardeners in cooler areas, since it will grow from zone 4 to zone 6, throughout the northern part of the country. It does best in areas with cooler summers and regular rainfall. For a similar type of specimen tree in warm regions, consider the Cedar Deodar, which makes a graceful tall tree. Douglas Fir (Pseudotsuga menziesii) is an American native tree growing from southern British Columbia, through Oregon and Washington state into the northern sections of California. It grows on the coast and inland to around 6,000 feet up the California Mountains. It is the world’s second tallest tree, commonly reaching 250 feet tall, but of course that takes ideal conditions and hundreds of years. It was named after David Douglas, a plant explorer and collector who was the first person to study the plants and trees of that area. It is not a true fir tree, which are all in the group called Abies. Douglas Fir in gardens generally grow 40 to 80 feet tall and 12 to 20 feet wide, so this is still a good-sized evergreen. Douglas Fir makes a beautiful lawn specimen, alone or in a group of 3 or 5 if you have a large lawn. It also makes an excellent wind-break to shelter an exposed garden to allow you to grow a wider range of plants, as well as developing into a privacy screen. 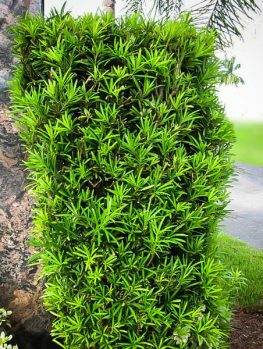 It can be left to grow naturally and it has a good, dense natural structure, or it can be clipped to give an even denser form. It grows best in well-drained soils that are normally moist or even wet, and needs full sun. It is hardy in zones 4 to 6 and does best in areas with cooler summers. It does not like hot, humid weather. So if you live in hilly or mountainous areas or in northern states, this tree is an excellent choice for a windbreak or specimen tree. The Douglas Fir is evergreen, with needles a little more than an inch long, grouped in two rows along the shoots. It produces small cones that are around 3 inches long. The tree has a strong central trunk with branches radiating out around it to make a very symmetrical conical shape. The bark is smooth and dark gray on younger branches, becoming thick and more cork-like as the tree matures. In good conditions growth can be quite fast, between one and two feet a year, so young trees can quickly reach a good height. One valuable feature of the Douglas Fir is that the lower branches are held for many years, so the tree does not develop a bare trunk as do many other evergreen trees. This makes it an excellent screening and windbreak tree as well as a lovely specimen to see standing on a lawn. 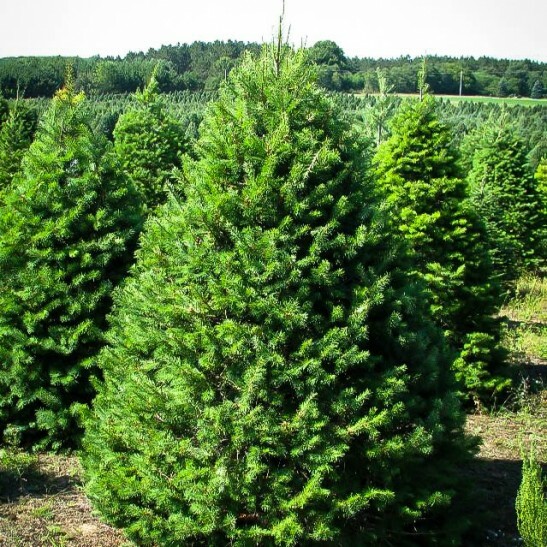 It is widely grown for Christmas trees, so if you want a tree on your lawn to decorate with lights in the festive season, a Douglas Fir is an excellent choice. Trimming the tips of the branches will encourage a denser tree, but it is not really necessary for a garden specimen. To plant your new Douglas Fir tree, dig a hole that is three times the width of the pot. If the soil is hard underneath, break it up, but it is not necessary to dig it out. Place your tree in the hole at the same depth it was in the pot and replace most of the soil, while firming it down around the root-ball. Fill the hole with water and wait for it to all drain away. Then replace the rest of the soil and mulch your tree with something organic, like garden compost, which will add nutrients to the soil. Keep your tree well watered during the first year, once a week or more if the weather is hot and dry. Add new mulch each spring, covering the root-zone as it grows but keeping the mulch away from the trunk. This will suppress weeds and protect the trunk from string-trimmers too. If you need to prune, do it during late winter or early spring. Do not prune during the growing season or in fall. 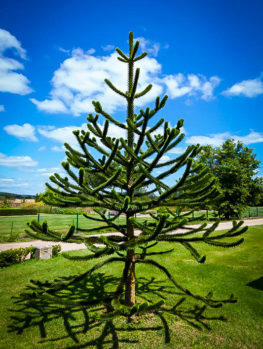 If you want to keep your tree trimmed start when it is young, because branches over 1½ inches to 2 inches thick are the largest you should cut on this tree. An annual light trim will keep your tree more compact and with denser growth. 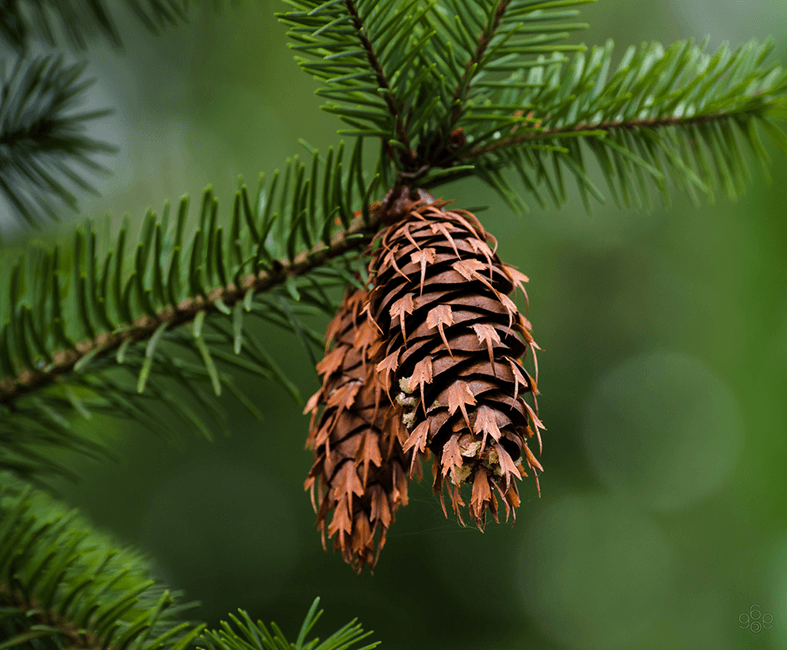 Douglas Fir trees can be variable in their quality and our trees are produced from seed of specially chosen parent plants that have outstanding growth characteristics, hardiness and good form. They are carefully grown under ideal circumstances to produce the best quality tree, so avoid cheaper trees that are grown from inferior seed under poor conditions, as they will only fail to give you the beautiful specimen you are seeking. 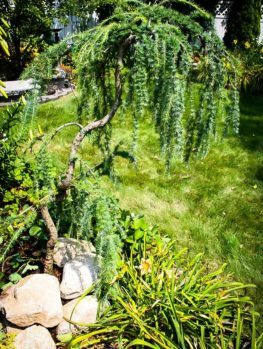 This is a special specimen tree for suitable locations, and this majestic tree is in high demand from knowledgeable gardeners. We constantly receive new supplies to make sure our customers receive the best, but supplies can be limited, so order right away to be sure you have this lovely tree.